A blog about search, search skills, teaching search, learning how to search, learning how to use Google effectively, learning how to do research. It also covers a good deal of sensemaking and information foraging. SearchResearch Challenge (3/28/18): Can science fiction stories be used to demonstrate prior art in patent cases? ... than just small pieces of art that signify an app. Icons can also be works that are so rich in meaning, so deeply embedded in our culture that they stand for more than just the thing itself. They can represent an entire zeitgeist and aspirations. When I was young, the year 2001 was such an icon. 2001 was the year when the future would officially begin. Of course, like the book 1984 (which is an icon for authoritarianism), the movie 2001: a space odyssey represented the grand and glorious techno-future, complete with moon bases, artificially intelligent computers, and regularly scheduled flights lifting from Earth into orbit. For Regular Readers of my age, 2001 (the movie and the year) is iconic. Of course, now it's 2018, and even the sequel to 2010: a space odyssey, Arthur C. Clarke's book (and movie) 2020: Odyssey 2 is set 8 years in the past. 1. 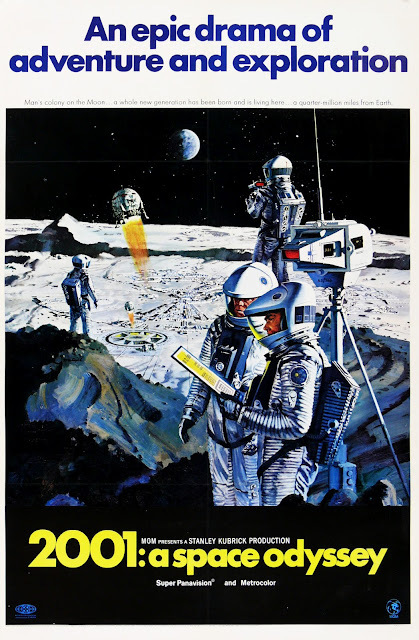 Is it true that there was a lawsuit about iPad technology that claimed the movie 2001: a space odyssey as prior art? 2. Have there been other lawsuits that have given similar arguments? (That is, that technology that was first drawn / filmed / written-about in science fiction invalidated a patent because it was prior art?) More generally, HOW would you search for such things? I'm primarily interested in US legal issues, but if you know about European (or other countries) legal issues like that, I'd love to hear about it. I'll give my answer next week, and give a bit of background about handheld tablet computers. Let use know HOW you figured this out. As I mention above, we'd love to learn a general method for searching out these kinds of legal actions. Answer: How to find dimly remembered things? If you're like me, you probably constantly re-searching for things you only vaguely remember. A few years ago, my friend Jamie Teevan of Microsoft Research did a study about how often people try to re-find information that they'd already found. 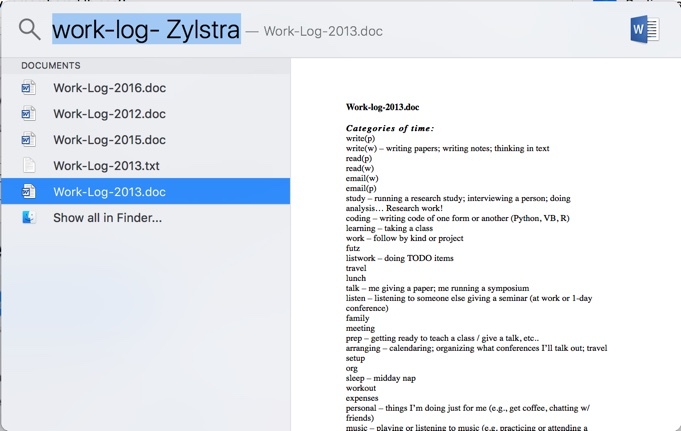 She found that 33% of the time, people are doing web queries that they'd done before. That suggests that people really are looking for memory support--a way to find things they've already found, and need to recover from the dusty halls of memory. We all have moments like this--a bare memory of something that you'd like to recover. But how can you do it? This week is about how to do that. Let's start with the first Challenge. 1. I remember visiting a bunch of colleges in the Eastern US with my daughter (who was checking out different institutions as a prospective student) and hearing a remarkable story at one of them. The story was that this concert hall was the one that staged a concert of a piece of music by a slightly crazed but rather famous composer who wrote a piece for orchestra and a complicated color-light display keyboard. The thing is, his vision exceeded the ability of the tech at the time. So, roughly a century later, this institution was able to ACTUALLY perform the piece as written--orchestra, light-show performance, and all of the special effects. Questions: What was that piece? 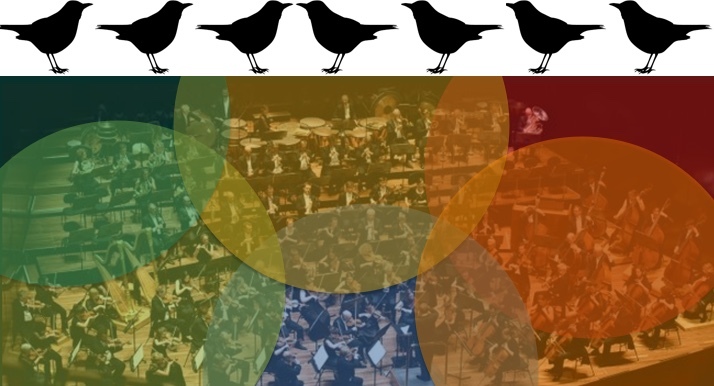 Who was the composer? And what university concert hall held this event? Here's a real problem: I remembered some things about this. It's easy for me to remember things around the thing I'm trying to remember. I remember that I'm in the Eastern US, with my daughter, at a university. All that context information might be useful IF I was looking for a photo, or trying to pin down the date of my exposure to this piece of music. In this case, I also remembered some things about the music itself (around 100 years ago, it's orchestra + light-show, with a complicated color-light display keyboard, performed at a university). 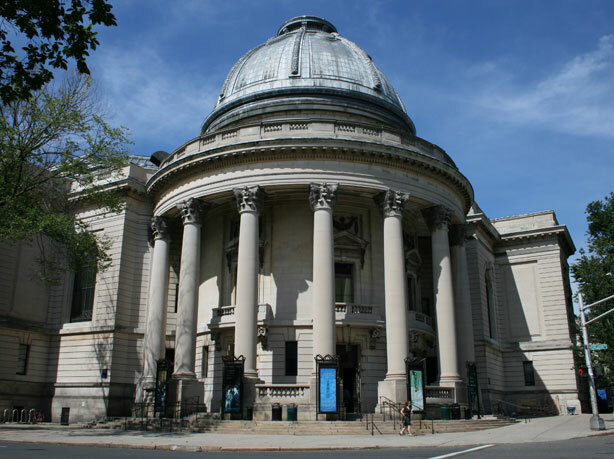 The very first result is a link to an article about Yale's 2010 performance of Scriabin's "Prometheus," with full light-show in the Woolsey Concert Hall. As it points out, this will be the "...first full-production of this multimedia work to benefit from contemporary lighting technology and the recent discovery of the composer’s hand-written directions for its execution." Checking my memory: Yes, Yale is a university in the northeast, and now that I see it, I remember walking through Woolsey Hall and hearing this story about Scriabin. Wonderful that can then look up my notes and find an image from that visit. Woolsey Hall, place where Scriabin's "Prometheus" was performed with full orchestra and a working luce device. In 1978, a first-edition score from 1913 was found with Scriabin's hand-written annotations, intended to give guidance for the performance of Prometheus: Poem of Fire. In it, Scriabin gives detailed annotations for the luce (the keyboard that drives the colored-light special effects) part. These instructions gave directions for color and lighting, along with special effects as tongues of flame, lightning flashes, and fireworks. For obvious reasons, this piece has been difficult to perform. It was probably beyond the technology of the time. It's worth watching (link to YouTube performance of "Prometheus" in Woolsey Hall from 2010), if only to get a sense for what the future of music looked like from 1910. I have to admit that I got lucky with this dimly remembered memory. It was the first hit, and then seeing the front of the concert hall tickled my memory. Yes, it WAS there that I first heard about it. The rest was easy. One thing I know about old nursery rhymes--they're complicated. Things are rarely as they seem. So I know I'm going to want to find a number of different sources on this. The first thing I learned is that the name of the poem is "Sing a song of sixpence," which gives me a whole other thing to search for. But as I read the Wikipedia version of the poem, it seems to give a reasonable analysis, particularly in its breadth and cautionary notes. A pocket full of rye. To set before the king. There are more verses, but I want to point out that in the poem, the blackbirds begin to sing once the pie was opened. That's encouraging--I had horrible visions of 2 dozen tiny birds in a strange version of a chicken pot pie. But since they're singing, maybe it really IS, as the Wikipedia article has it, merely a fake crust with the birds inserted from below just before serving. It's a kind of joke pie that has live birds inside, so when the unsuspecting diner cuts into the pie, birds sing and fly out. Interestingly, there is a Snopes.com article asking if this nursery rhyme was a secretly coded pirate recruiting verse. (See Snopes.com on "Four and Twenty Blackbirds") The big surprise is that this is listed as a big TRUE! However... if you read carefully (something I always recommend), you'll see a "More information about this page" link at the bottom. "... If you’re reading this page, chances are you’re here because something about one or all of the entries in The Repository Of Lost Legends (TROLL) section of this site struck you as a tad suspect, if not downright wrong. If any or all of the stories in this section caused your internal clue phone to ring, we hope you didn’t let the answering machine take the call. That niggling little voice of common sense whispering to you in the background was right — there was something wrong with what you read. You’ve just had an encounter with False Authority Syndrome. Everything in this section is a spoof." I've had more than one of my students get caught by this. Mind you, Snopes has these pages as an object lesson. They are explicitly telling you to be cautious of all authority--including theirs! In particular, their tale about the "Four and twenty blackbirds" pie is one of these "Lost Legends," and utterly made up. Do not be fooled. 3. I have a couple of tools that I use every day to help me find things, particularly when I'm searching through my personal content. 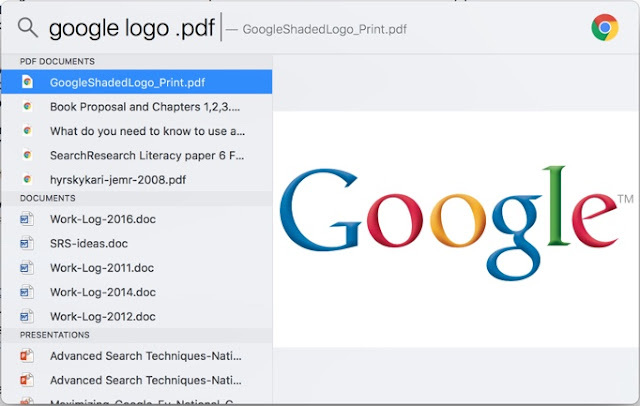 What tools do you use to search your personal content? (Of course, we all use the search engines of the world--Google, Bing, Baidu, Wolfram Alpha, etc.) But if you're looking through YOUR stuff, what tools do you use to search through that? The comments in last week's post are pretty interesting. 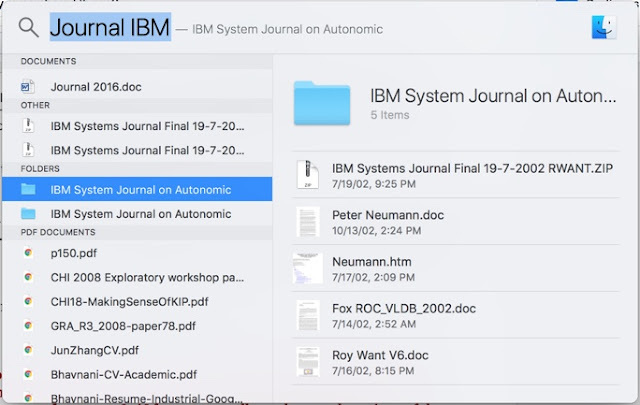 People made all kinds of good suggestions (such as Michael Michelmore's suggestions on folder naming and structuring your personal data, or Debra Gottsleben suggestion to bookmark things). I have a problem (maybe you do too) that my "personal content" is spread across 2 email systems (my personal and my corporate), two Google Drive accounts (personal and corporate), and my hard drive. My strategy is to first search my hard drive using Apple's Spotlight search function. This is a wonderful application that gives very fast access to everything on my drive. This is on the Mac, but there's a similar app for the PC universe as well. I've used X1 in the past, and completely loved it. (I really wish I had it on the Mac--hint-hint!) It is as fast as Spotlight, but lets you do all kinds of metadata filtering as well..
Truthfully, I'm not sure what I'd do without Spotlight. It definitely makes everything I do on the Mac just that much faster. 1. Remember number range! In my first query I searched for numbers in the date range I was interested in. It's not YEARs we're searching for, but NUMBERS in that range (which will very likely be years in a text document). 2. The Snopes spoof reminds us to read carefully. When you read think that don't seem to make sense.. check carefully! Or, as Roman Mars (99% Invisible), always read the plaques. SearchResearch Challenge (3/14/18): How to find dimly remembered things? ... and that's part of the reason we have search tools--to help us find and recover what we've forgotten. I don't know about you, but I'm constantly re-searching for things I only vaguely remember, and I need all the help I can get. This week's Challenge comes in three parts. First, a question of something I once heard about, but have forgotten. Second, a question of something we have collectively forgotten (or somehow misplaced) in our cultural memory. And third, a question to you of what tools you use to help find things forgotten or misplaced in memory. I managed to find the answer to Challenge 1 already. I think I have an answer for Challenge 2. And I know what I do for my personal search. But tell us what you found in the comments. Be sure to tell us HOW you found it (what path led you to the answer). And I'll give you my answers next week. If you do active online research (which is pretty much the whole point of SearchResearch), you fairly often run into web pages that are 404. When this happens, it means that the link you're trying to follow leads to a page that is missing. It might have been removed by the author, or just moved elsewhere. In any case, the link you've got doesn't work any more. This actually happens more often than you'd like. and Google will serve up its cached version of the page. But every so often, that cached version is missing as well. THEN what? A friend told me about a Chrome extension called WayBack Machine that watches your browsing activity, and if you get a 404 error, it jumps in and offers to search for that URL on the Internet Archive's Wayback Machine (which is an incredibly useful archive web page, including ones that have disappeared). Alas, the cache: operator doesn't retrieve anything for this page. In this case, it brought up the archived page beautifully. Now I can read what was once deleted. Here, it's gone all the way back to July of 2010. If you do much online research, I recommend this extension. It'll save you a bunch of time. Answer: How did this group of houses get to be here? 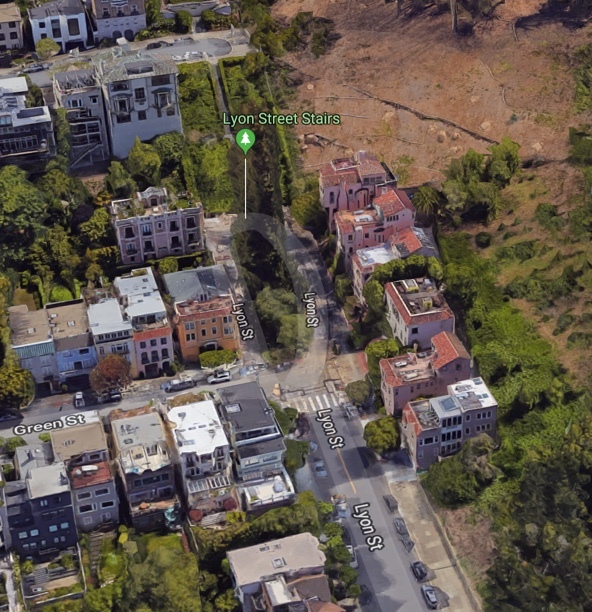 ...our SearchResearch Challenge this week was to figure out the history behind this funny group of houses that extends from Lyon Street into the Presidio. 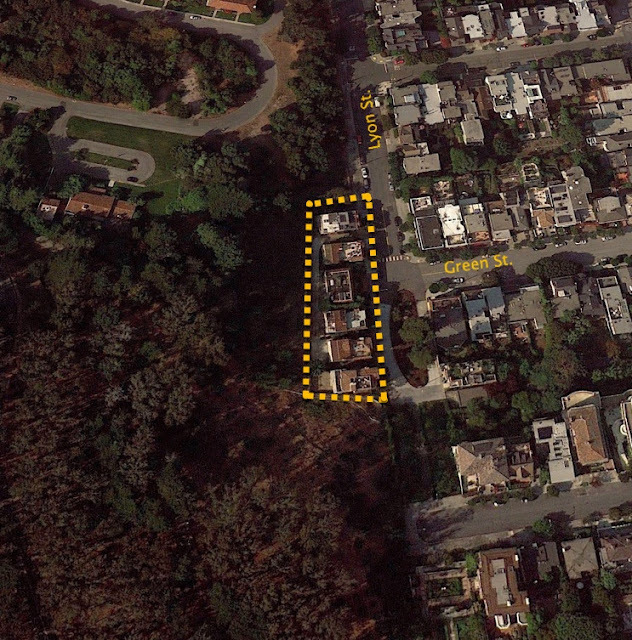 Here are the 6 houses that have somehow pushed the boundary of the Presidio a bit to the west. 1. What's the story behind this odd row of six houses that are inset into the natural boundaries of the Presidio? How did this state of affairs come to be? I have to admit that I was a little puzzled about how to even describe this set of six houses. So, how can I find out about this funny set of houses? My first thought was to go back and look at a previous SRS post--the one on Who Owns that Piece of Land. 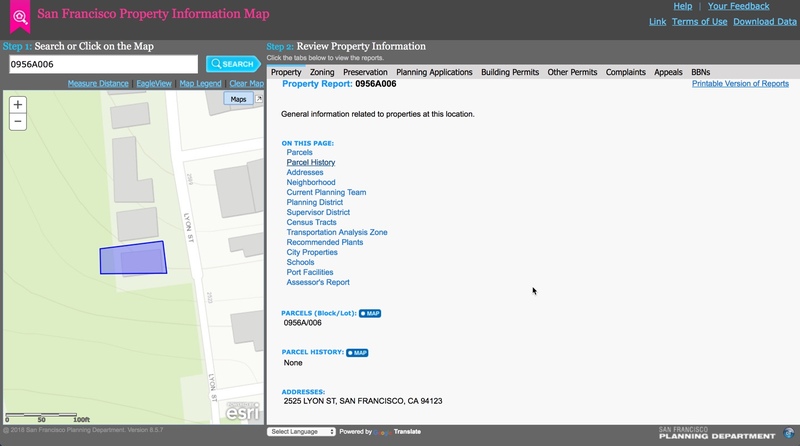 That post recommends first searching for the street addresses, then checking Wikimapia, then checking the county assessor's map. This looks great! There's even a "parcel history" link. Alas, when you click it, the history is blank. Drat. 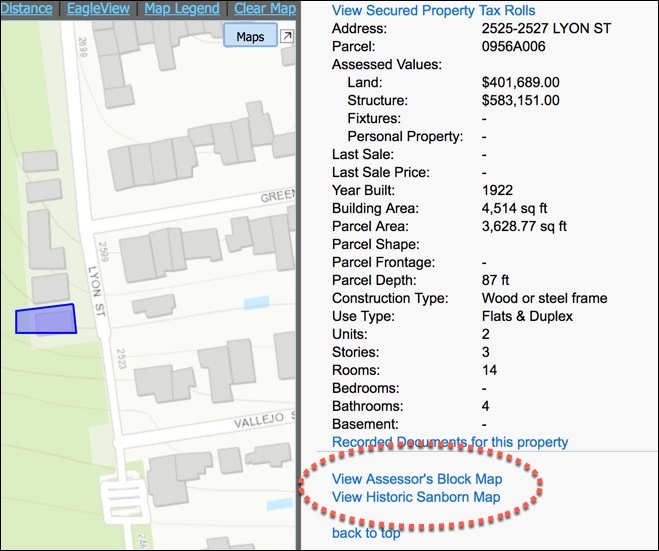 Know we know that this is Assessor's block 956A, developed in 1922. 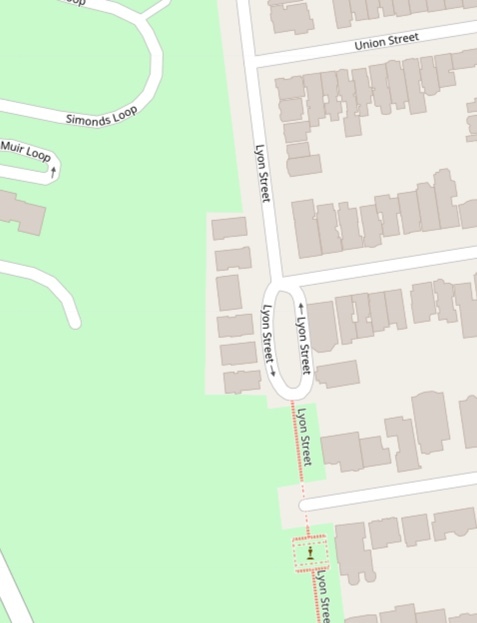 And clicking on the Sanborn map link gives us this excerpt (check out the note on the really steep part of Lyon street--the part to the right of this diagram... "Impassable for teams"--meaning that horse teams couldn't go up this section--that's where the Lyon Steps are today). We have also figured out that it really IS the Presidio Military Reservation on all sides of the enclave. We also have another clue: this isn't just tract 956A, but in the upper right we see the name "Miranda Tract." ... leads to a number of low quality results (lots of houses for sale, etc.). 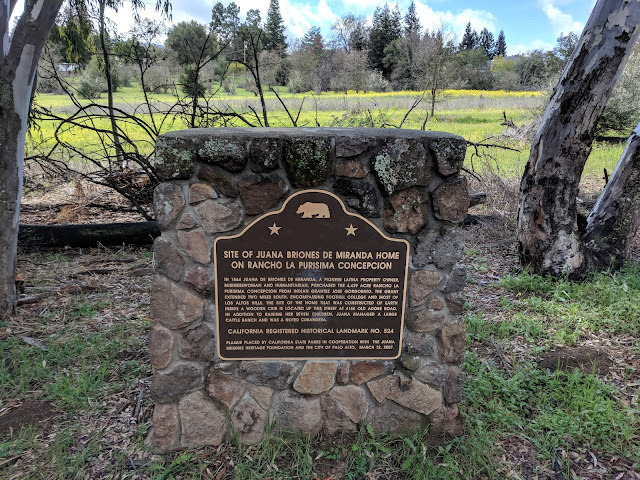 BUT I persevered, and found that the 10th result of the SERP is a link to the book California Ranchos (by Burgess McK Shumway), which tells us that there are two tracts of land granted to someone named Miranda. One of them would turn out to be the Miranda Tract in San Francisco. On page 91 we find that "Ojo de Agua Figueroa" of 100 varas (about 1 acre) in San Francisco was granted to Apolinario Miranda in 1838. Meanwhile, on page 119 we learn that "La Purísima Concepción" was a grant in Santa Clara county (a bit south of San Francisco) to Juana Briones de Miranda in 1871. What do you suppose the chances are that these are connected somehow? and found multiple hits for this. 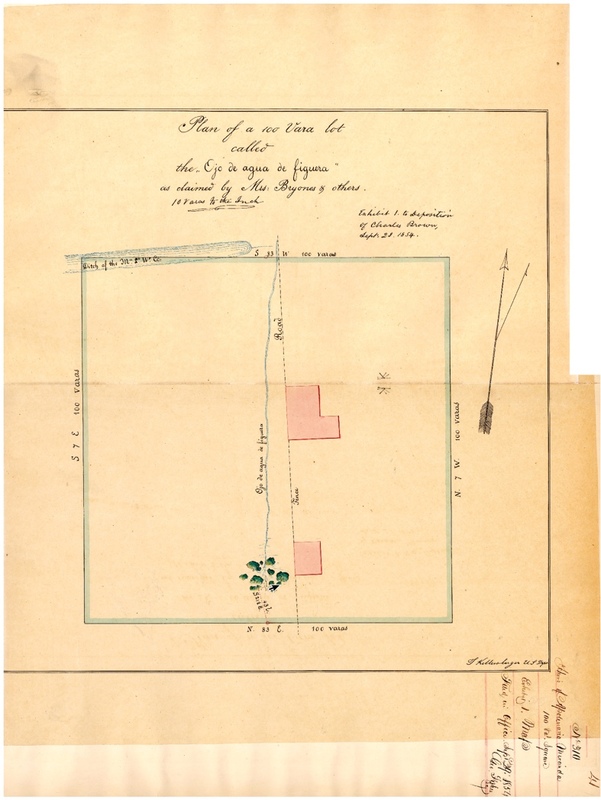 Probably the most interesting document was at the Digital Commons collection of Californian historical documents which has a digitized copy of the original map of this grant. 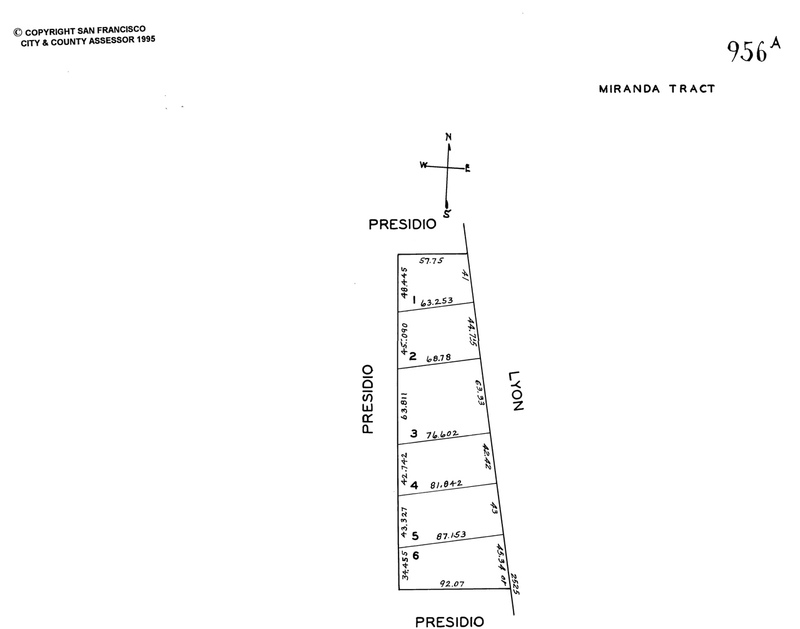 This map, called a diseño marks the boundaries of this property that was granted to Apolinario Miranda. But look in the lower right corner. There's a legend that says "Heirs of Apolinario Miranda.. Sep 29, 1854" Meanwhile, at the top of the diseño is the text "Plan of a 100 vara lot called the "Ojo de agua de figuera as claimed by Mrs. Bryones and others. 100 varas to the inch." Given that spelling was fairly loosey-goosey in these days, do you suppose that "Mrs. Bryones" and "Juana Briones de Miranda" are the same person? The map shows that the "Ojo" flows from a cluster of trees. But is the Ojo near Lyon Street? "The Ojo de Agua stands out in a city replete with unusual corners. 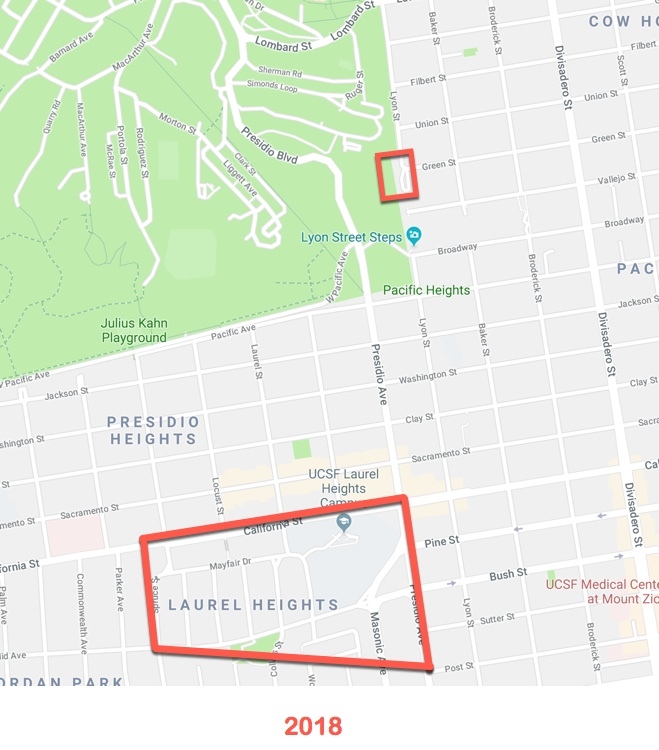 Its western boundary shows on ordinary San Francisco street maps as a rectangular notch in the otherwise straight Lyon Street border of the Presidio, straight because no claimant other than Juana won suits for title to lands that impinged on the Presidio. Six tall, elegant residences now grace the indentation that juts into the wall of the former army base and present national park. In proving up her claim as Apolinario's widow, Juana hired the best attorney in California, Henry Wager Halleck, which assuredly helped." That pretty much answers the question. That notch is the remainder of the old Ojo de Agua diseño that was originally granted to Apolinario Miranda, but then asserted by the widow Juana Briones de Miranda. Lyon Street / Ojo de Agua. Google 3D view. We achieved our goal and answered our original question about why that notch in the Presidio is there. But in the process of doing this research, are two other things have come up that cry out for further investigation. 1. Who is Juana Briones de Miranda? That book we found earlier ( Juana Briones of Nineteenth Century California) is full of fascinating detail about her life's story. Obviously, she's the wife (and later, widow) of Apolinario Miranda. In 1820, Juana married Apolinario Miranda, a cavalryman stationed at the Presidio. They settled on their Ojo de Agua de Figueroa location. Apolinario and Juana eventually had eleven children, eight of whom lived to adulthood. Juana tended sick sailors and converted her attic into a sanctuary for deserting sailors while arranging for their passage to her brother's ranch in the East Bay. In 1835, Juana’s husband had become abusive and, with the aid of a local bishop and the mayor, she moved to the western foot of Loma Alta (now called Telegraph Hill). She also managed to somehow get an annulment of her marriage to Apolinario. At Loma Alta, Juana built a small adobe home—the first private house built between the Presidio and Mission Dolores... and held the title in her own name. Juana sold milk and vegetables to ships' crews and also serving as a nurse and midwife. Without formal medical training, she treated smallpox and scurvy patients, delivered babies, and set broken jaws. In reading through this text we find that she IS the same Juana Briones who got the grant of "La Purísima Concepción" grant in Santa Clara county, some 40 miles south of the Ojo. You can see the original plat of the grant from 1863. Now this gets personally interesting because this is one of the places I go running quite a bit. Naturally, I did a search for [ Juana Briones home ] to see if I could find where she lived. It didn't take long to find the SavingPlaces website for the Briones adobe (dedicated to finding and preserving historic buildings). And in that site I found that the house was located at 4155 Old Adobe Road (gee... wonder why it was given that name?!). When I do research, I always expect to learn interesting things... I just don't expect them to lead practically to my back yard. And I didn't expect to learn about an early California wonder-woman who defied expectations and overcame all kinds of limitations of her era. What a remarkable person! 2. What happens to this area of San Francisco (near Lyon Street) over time? I ask because I noticed something interesting. 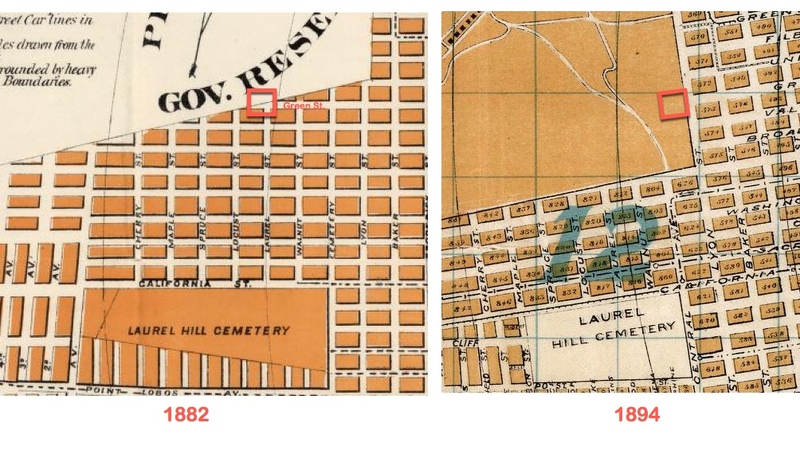 One of my attempts to figure out what happened was to look for old maps of San Francisco. Luckily, I happen to know that the Rumsey Maps Collection (at Stanford University, which you could easily discover by doing a search for [ old maps San Francisco ] ). By searching there for maps of SF, I found a bunch, and it was easy to find maps of the region. Drawing on those resources, I made some side-by-side comparisons of the greater Lyon Street area with the Ojo de Agua area marked off in a red box. Notice that the 1870 map is just plain wrong. Green Street ends at Lyon, not on Walnut. Something went serious askew here. On the other hand, a map from just a few years later gets it right (1876). A different kind of error is made in 1882. In the map on the left, the 1882 map by the Faust company gets the intersection of Green Street all wrong. I added the box at the place where Green St. hits the edge of the Presidio. That should be Lyon St., but someone messed up this entire section of the city. Luckily, the 1894 Faust company map has it fixed up. This is correct, but doesn't show the Miranda Tract. In 1906, there's a small shadow showing the Miranda Tract, although nothing has been built there. 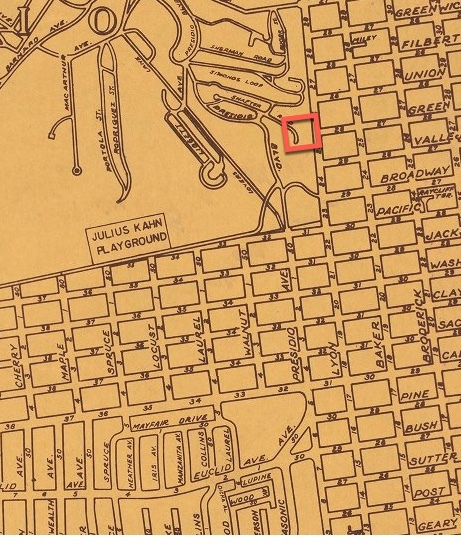 And in 1926, the first official map that recognizes the Miranda Tract with the Lyon Street enclave is seen. However, look at this map from 1963. Notice anything really different? The houses are still not marked, but there's another, even bigger difference. The greater Lyon Street area, 1963. We seem to be missing the Laurel Hill cemetery. Look near the bottom of the map, just to the left of Pine, Bush, and Sutter. See what's NOT there? Compare with this current map of the area. That big tilted box at the bottom is the location of the former Laurel Hill Cemetery. quickly takes us to a multitude of articles that all say the same thing (example: Mercury News or San Francisco Curbed history site). 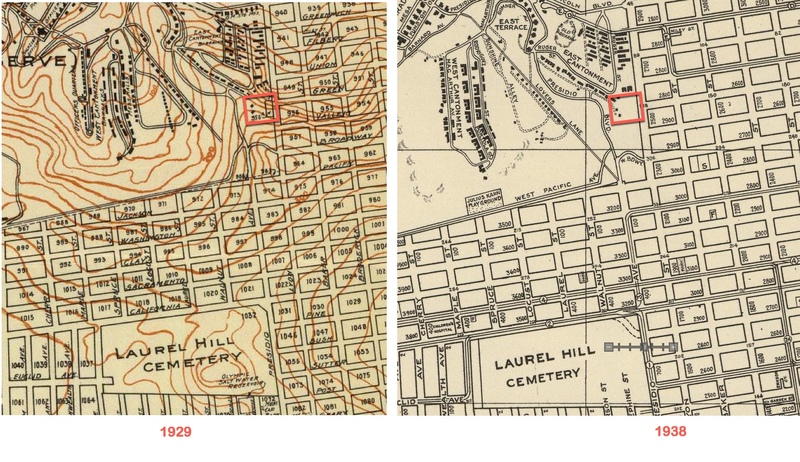 After years of filling up the western side of San Francisco, the city supervisors realized that they needed to remove the cemeteries from the city, and forced the cemeteries (of which there were many--including one for the Catholics, one for the Masons, one for the Independent Order of Odd Fellows, etc.) to remove the bodies from the city. 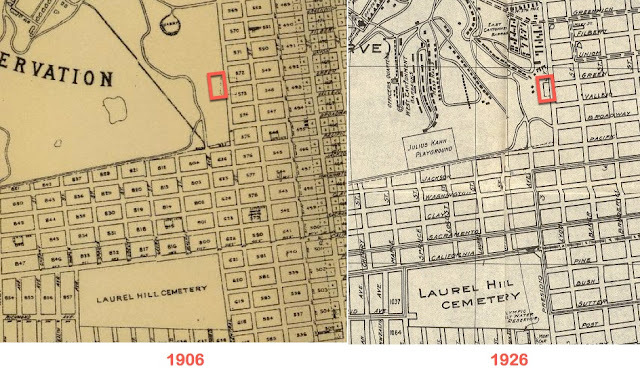 Laurel Hill, one of the larger cemeteries, was set up in 1892. But when the order in the early 1930s came to exhume the bodies and relocate them to points farther south, Laurel Hill (and others) fought back. But it's hard to fight City Hall, and by 1937, the city election forced the issue and the entire dead population of San Francisco was forced to retire to the next city to the south, Colma. Starting in 1940, organized disinterment began, with around 2,500 bodies being moved each month. Even so, it took years to move the dead. Every day, a parade of hearses left San Francisco for Colma with new refugees from the northern necropoli. 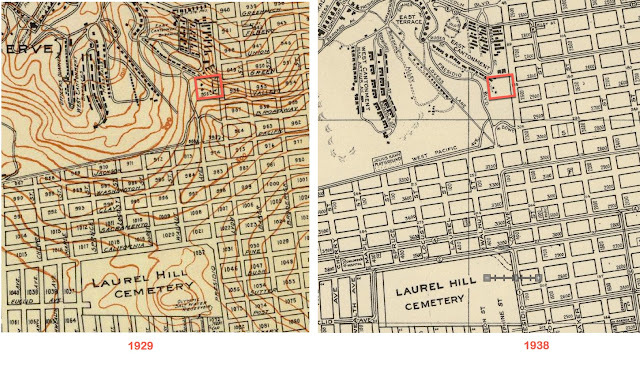 The 35,000 former inhabitants of Laurel Hill are now all in Colma, merged into a subterranean crypt now called the Laurel Hill Mound. But, to this day, occasional gravesites are still found in San Francisco. The former cemetery is now the Laurel Hill campus of the University of California, San Francisco. I guess it's true what they say, "the dead shall be raised" ... if the City wants the land. 1. Expect the unexpected. Keep your powers of observation sharp! This Challenge took me a while because I kept finding new and ever more interesting things about early San Francisco. 2. Even small clues can have a big impact on your search process. In this Challenge, finding the words "Miranda Tract" on the County Assessor's map of Lyon Street opened up the search process tremendously. I was having trouble figuring out how to search for this odd grouping of houses. But when I found the Assessor's map, and noticed those words on the plat--I could use those terms to track down everything else. It was the key that unlocked the whole Challenge. Pay attention as you find things! Hope you enjoyed this Challenge as much as I did! In the spirit of Juana Briones, Happy International Women's Day! Wednesday search challenge (Feb 1, 2011): Where are you? Search Challenge (November 9, 2011): How do people spend their time? Answer: How many center-pivot irrigation systems do you see? Wednesday Search Challenge (2/15/12): Is that a musical instrument? Wednesday Search Challenge (2/29/12): Impossible, yet simple?